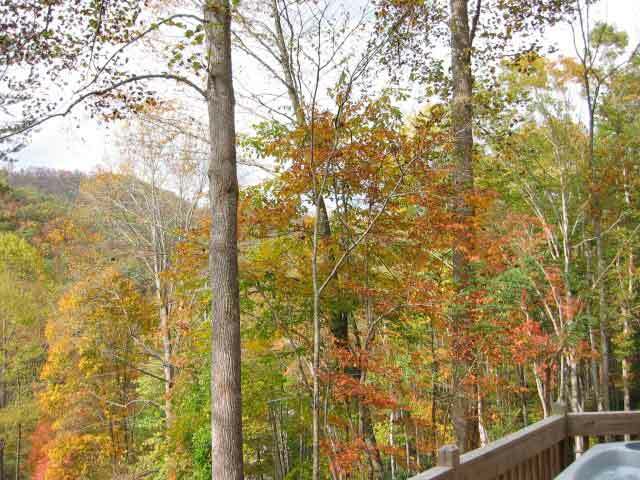 Western North Carolina romantic honeymoon cabin with hot tub and Jacuzzi for rent near Nantahala River White Water Rafting - Nantahala NC, Macon County. Western North Carolina romantic, cozy, honeymoon vacation cabin rentals. 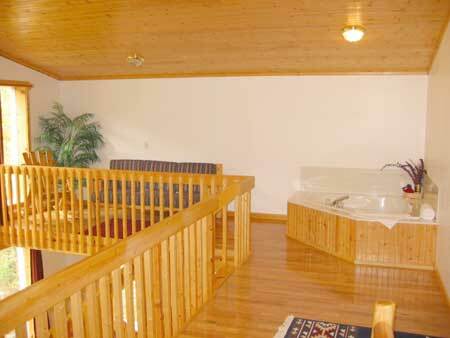 NC honeymoon vacation chalet, cabins for rent for your honeymoon or romantic weekend. Honeymoon chalets, cabins for rent in North Carolina. 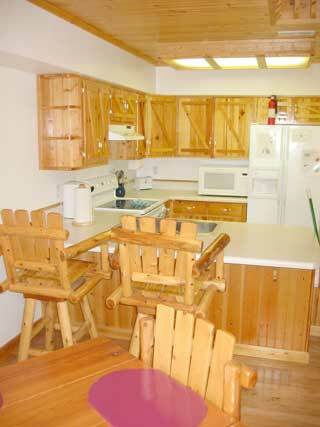 NC Cabin rentals close to Nantahala river white water rafting. 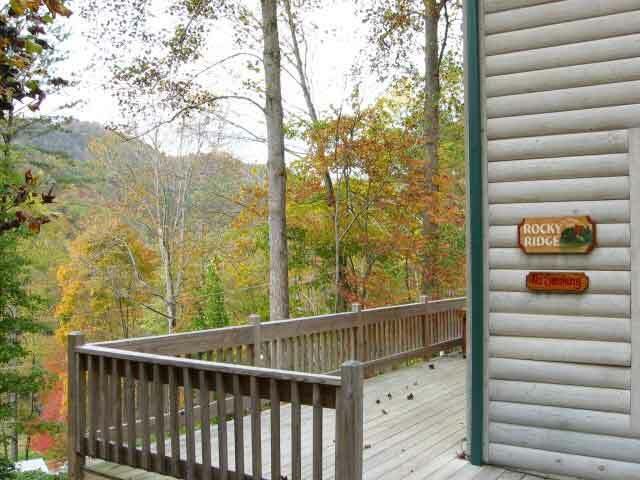 Great Smoky Mountains honeymoon cabin rentals. 'A Mountain Memory' has NFL Sunday Ticket. yet just minutes to Nantahala River white water rafting. Yes, we enjoyed our stay very much! :-) The cabin is so cozy and spacious---it was really so much more than we expected. We also loved the small town atmosphere of Andrews (we did our grocery shopping there). It was the perfect place to spend our honeymoon! I'm sure we'll be back! 'A Mountain Memory' is a quiet, secluded cabin offering two bedrooms, two baths, and easy access to the Nantahala River. This charming cabin features a comfortable rustic decor with pine paneled cathedral ceilings and wood floors. Relax in the hot tub and enjoy the peaceful surroundings on the large deck, complimented by a picnic area and outside grill. Escape to the mountains for whitewater rafting, fishing, mountain biking and hiking, while enjoying all the conveniences of home. We had a fabulous mountain get-away at "A Mountain Memory". We found everything we could have wanted and needed at the cabin upon arrival! The box of chocolates & the dim light left on added a nice touch, especially since we didn't arrive until 11:00PM. The place was spotless and in brand-new condition. The kitchen was fully stocked, even with coffee & fixings, spices for cooking, and a few odds and ends to start a meal. We were able to relax with the Jacuzzi and hot-tub, the lounging chairs & rockers, but to make our stay even more comfortable you added those extra touches of: bathrobes, candles, soft pillows, huge screen TV, DVD, surround sound, blankets on the couches, etc. The cabin was luxurious and we hope to return soon. Thank you for a wonderful stay! Thank you! We had a wonderfully relaxing vacation! You have a great place in a great location and we would love to visit twice a year. You have a great place! Very cozy. Very comfortable. Amenities include all-glass front wall for a beautiful mountain view. A rock faced fireplace stove with gas logs. 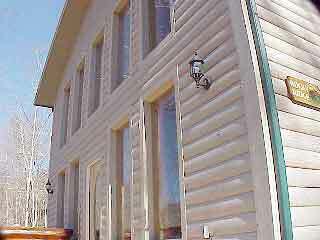 Washer/Dryer, central Heat/Air, a well equipped kitchen with microwave, coffee maker and dishwasher. Entertainment amenities include a four person hot tub on the deck, a large screen TV with satellite system, DVD and VCR player. We had a great time. The cabin was clean and very comfortable. Want to return during other seasons as well. It was a relaxing and the perfect get-a-way. Thank you for everything. We intend to return. My husband and I had a great time. We would definitely visit again. The cabin was immaculate and everything was just as described. It looked like it had never been lived in. I would recommend it to anyone who simply wants to get away!! Thanks for renting your cabin to us. We had a really enjoyable time. It's a beautiful cabin in a peaceful, secluded location. We would love to return someday. Don't miss the fabulous Autumn Leaf Season... and remember to reserve early. Nature's annual autumn color festival is certainly one of the greatest shows on earth and the peak begins in North Carolina's mountains higher elevations in late September and lasts to early November in the lower valleys. Fall leaf color reports, along with suggested drives, events calendar and plenty of area information. This Vacation Rental Cabin is near Nantahala River White Water Rafting, Nantahala Outdoor Center, Nantahala River and Lake Nantahala River trout fly fishing, USFS Tsali Recreation Area Mountain Bike Trails, Appalachian Trail hiking, Joyce Kilmer Memorial Forest, Lake Fontana and Fontana Dam, Great Smoky Mountains National Park, Cades Cove, Great Smoky Mountains Railroad Excursions Train, Cherokee Indian Reservation, Cherokee Harrah's Casino. 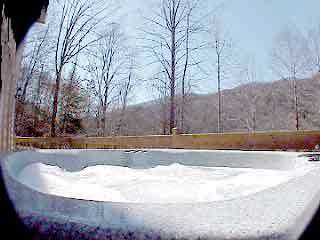 Western North Carolina Mountains, romantic, cozy, vacation honeymoon rental cabin. 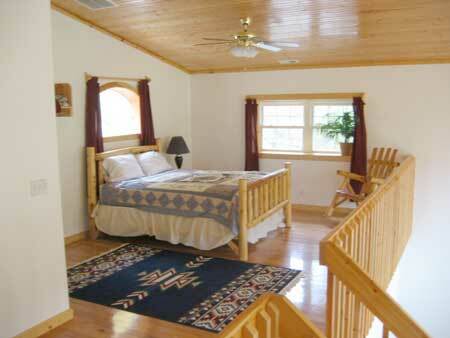 NC honeymoon vacation chalet, cabins for rent for your honeymoon or romantic weekend. Honeymoon chalets, cabins for rent in North Carolina. 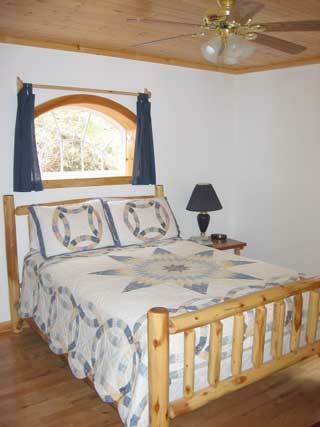 NC honeymoon cabin rentals close to Nantahala river white water rafting. 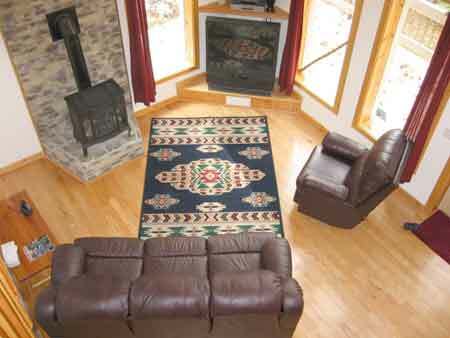 Great Smoky Mountains honeymoon cabin rentals. The Nantahala River, located in the USFS Nantahala National Forest, is one of America's favorite whitewater playgrounds. Its ideal location at the edge of the Great Smoky Mountains National Park, close to Atlanta GA, Knoxville TN, Greenville SC, Asheville NC and just a short distance from Murphy, Andrews, Robbinsville, Franklin, Cherokee and Bryson City, NC makes the Nantahala River convenient to mountain vacationers. More..
Fontana Lake is located in the western North Carolina. Appalachian Mountains of Graham County and Swain County. Fontana Lake is a 29-mile-long scenic mountain lake with more than 280 miles of shoreline and nearly 11,000 acres of water. The 480-foot-high Fontana Lake Dam on the Little Tennessee River is the tallest dam in the TVA system. The Appalachian Trail, which extends over 2,000 miles from Georgia to Maine, crosses the top of Fontana Lake Dam. With most of Fontana Lake's 280 miles of shoreline preserved by the the Great Smoky Mountains National Park and USFS Nantahala National Forest, Fontana Lake's breathtaking beauty remains unspoiled. Quiet secluded coves and inlets on Fontana Lake provide excellent opportunities for swimming, boating, fishing, or just relaxing and enjoying the view. From the spring's mountain laurel to the glorious colors of fall, Fontana Lake's engaging scenery can be enjoyed year round. Game fish in Fontana include smallmouth and largemouth bass, white bass, walleye, and crappie. Lake Chatuge is a beautiful clear waterlake surrounded by mountains of both Georgia and North Carolina. The sprawling fingers with many islands and coves cover 9000 acres and have 200 miles of shoreline. A great majority of the Lake Chatuge borders USFS national forest or is owned by Tennessee Valley Authority and is undeveloped. Lake Chatuge is known to have good bass fishing and is regularly stocked. Large Canadian geese can often be seen in the spectacular rural and mountain scenery of Lake Chatuge. Lake Chatuge is located on the Hiwassee River in western North Carolina. The reservoir is named after a nearby Cherokee settlement. Hidden away among the towering Blue Ridge mountain peaks is a sparkling jewel.. Lake Lure, North Carolina. And, it's waiting for you to discover it. Lake Lure is approximately 720 acres, with about twenty-one miles of shoreline. National Geographic has called Lake Lure one of the most beautiful man-made lakes in the world. Located in Western North Carolina, Lake Lure lays in the heart of Hickory Nut Gorge. East of Asheville, the Rocky Broad River tears its way in a series of rapids down through Hickory Nut Gap. This crystal clear water flows through a valley shaped roughly in the form of a Maltese cross to make Lake Lure. Lake Lure has great stretches of crystal clear water, three long bays, an island of seven acres and many small bays and inlets with a background of tree clad hills and mountains. Vacation homes for rent in North Carolina. Vacation homes for rent by owner. 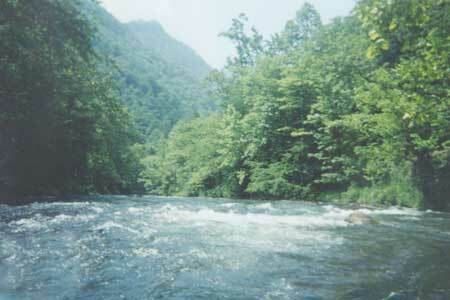 cabin rentals on the nantahala river. vacation house rentals. Water lakefront vacation home for rent in Georgia. North carolina vacation house rentals, north carolina travel, north carolina tourism, north carolina vacation, asheville north carolina, ashville north carolina, boone north carolina, cherokee north carolina , blowing rock north carolina, franklin north carolina, brevard north carolina. whitewater rafting in north carolina, tennessee whitewater rafting, nanthala, nantehala, nantahale, nantala, nantahala river white water rafting, nantahala river kayak, nantahala river rafting, nantahala national park, ocoee river rafting, white water rafting, nantahala outdoor center, nantahala national forest, nantahala river lodging, nantahala river cabin rentals, great smoky mountains cabin rentals, cabin smoky mountains. mountain vacations of north carolina, smokey mountain vacations, north carolina mountain vacations. georgia mountain vacations, smoky mountain vacations. Fall autumn leaf color season calendar, fall leaf season calender.